Join your celebrity guest host John Bishop, chef, cookbook author and acclaimed restaurateur to Iceland - a country of sharp contrasts. A place where fire and ice co-exist. Where dark winters are offset by the summer’s midnight sun. A country where insular existence has spurred a rich and vibrant culture. Contact Jenny Karmali for up-to-date information. VANCOUVER, BC - British born John Bishop, who has been cooking since his early teens, attended hotel school in Wales and served his apprenticeship at a private London club. After ten years as chef at a restaurant in Kinsale, County Cork, he came to Canada in 1973, where he continued to pursue his culinary career. 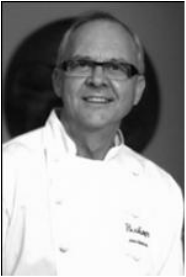 In 1985 he launched the restaurant that bears his name Bishop’s, located in Vancouver, was an immediate success and continues to garner accolades. The fare at Bishop’s is regional and seasonal. In Chef Bishop’s view, it makes sense to showcase British Columbia’s lush bounty of seafood, organic produce and meats. His exquisite West Side restaurant blends classic and modern flavours with a casual elegance that keeps clients coming back for a truly exceptional dining experience. The Vancouver Hospice Society (VHS) was incorporated as a non-profit charitable organization in December 2003. It was formed by a group of concerned individuals who recognized that Vancouver needed a Hospice Society to advocate for those facing end-of-life care issues and their families. The Vision of the VHS is to build small freestanding hospices, where the dying can live with dignity and where family and friends feel welcomed and supported as part of the care team. All this has been made possible by individual donors and by the achievements of our two successful volunteer-run charity shops, The HOB and HOB Too, as well as our annual Butterfly Gala fundraising event. Vancouver Hospice Society relies on fundraising initiatives to provide these important programs. With the continued support of our community, we will continue to care for those in need of hospice services. For the complete tour information including your day-to-day itinerary, please download the Tour Brochure HERE. For more information or to book please contact Jenny Karmali.